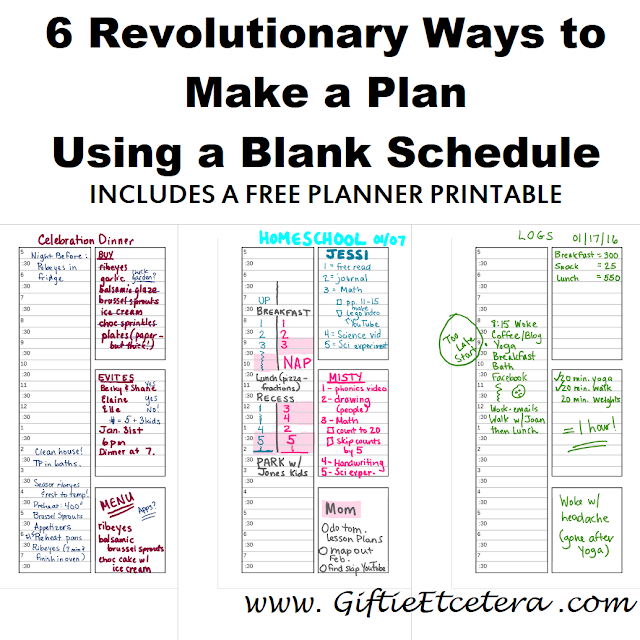 As part of my ongoing monthly planner series with Becky from Planner Fun, I am showing you 6 new ways to use her newest, free planner printable. Stay tuned for the link directly to the free printable at the bottom of the post. When Becky sent me this particular design, I knew it was completely different than other schedules that I've used before. In the past, when I demonstrated how to use a schedule, I focused on the time slots. That post was really popular, but far less detailed than this one. This time, I was determined to think of new ways to work the much more flexible format that Planner Fun had created. I thought of 6 different ways to use this unique form to help my readers make superior plans. 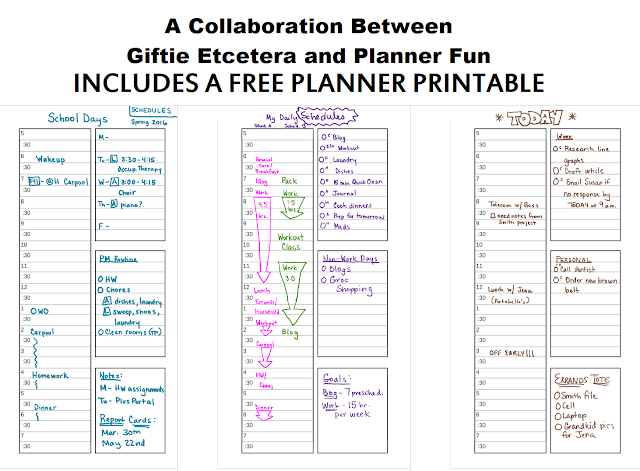 Join me on Facebook to share pictures of how you end up using the form, with the hashtags #GiftieEtcetera and #PlannerFun in your image posts! Whether you are a student or the parent of a student, keeping track of school schedules is a challenge. School schedules tend to be repetitive and set in advance. If you run a business or work in an office, there may be a repetitive, set schedule culture, too. For example, when I worked as a law clerk, we had court every morning at 9 a.m. and staff meetings at 3 p.m. as needed. Lunch was always at noon. On Fridays, we had a half day. In some ways, that sort of job felt very much like school. Note that I added exceptions to the normal schedule (like weekly meetings) in the top right box, the after school routine in the middle right box, and relevant notes in the bottom right box. If you work in a more self-directed way (even if there is some outside influence on your schedule, like a yoga class, a daily conference call, or a carpool pick-up time), having a couple of different potential schedules to work from can help you plan your day quickly and effectively. Just hole-punch this and put in the Notes portion of your planner for reference (or the Projects portion, if you access it regularly and often). Notice that I put two potential schedules side-by-side. One is for a regular day and one is for days when I attend a live exercise class. I also listed daily tasks, optional tasks for non-work days, and some goals. Of course, this form is great for just a normal schedule for the day, along with work and personal lists. Some days are special, but require hour-by-hour planning to pull off. Whether you have an important meeting or are cooking a large meal, this schedule makes a great one day Project page. If you homeschool (even multiple kids, as shown in the example), these individual sheets makes excellent lesson plan pages. Each kid can have an individualized plan and the parent can highlight lessons that require extra parent attention. Lawyers and billable hour folks can track right on this form. 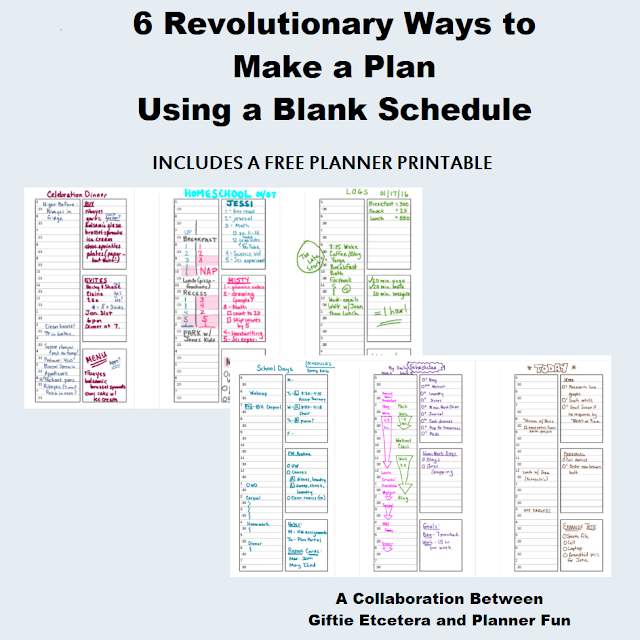 Plannerds can do a log of time to see how time is actually spent and make wiser choices. Don't forget to note other log goals in the boxes, like amount of money made, calories eaten, or minutes exercised. These pages also make a great medical log. Now head over to Planner Fun to grab your free printable! I love how well thought out your plan is. Many bloggers will benefit from this post. Thanks for sharing at #overthemoon! Lots of great ways to use the printable. :) I think the the timed schedule on one side, and the 3 boxes on the other side is genius. thank you! Working on ways to streamline my planner, so this is a great template for me. These are great! Even though I have a set work schedule I use a planner to keep track of my blog posts too. This is great. I love the format of the sheet and you came up with some great ways to use it! Printing out a copy to give it a try. Thank you for sharing at the Faith Filled Parenting LinkUp. Do you know, I never fail to learn something new about using planners when I visit your site? Thank you so much for sharing this with the Blogger's Pit Stop! I downloaded printable. love the layout. It is perfect for a busy day.